As a travel writer, I often compile itineraries on how best to explore places around the world. So here’s one for a weekend on my own little piece of paradise, Whidbey Island. 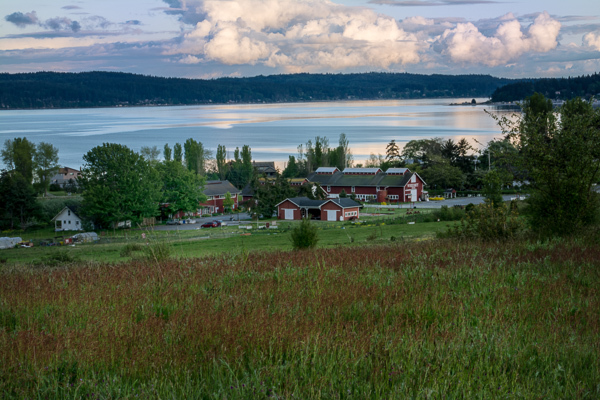 Set south of the San Juan Islands and framed by the Olympic and Cascade ranges, Whidbey offers the perfect pastoral setting for whale watching and top-notch wineries, art galleries and gourmet dining—all within an hour’s reach of Seattle. Better still, since it’s located in the Olympics’ rain shadow, the island gets about half the rainfall for which the city is infamous. This itinerary is based on crossing via the Mukilteo-Clinton ferry and is centered in the town of Langley (approximately 10 miles from the dock). 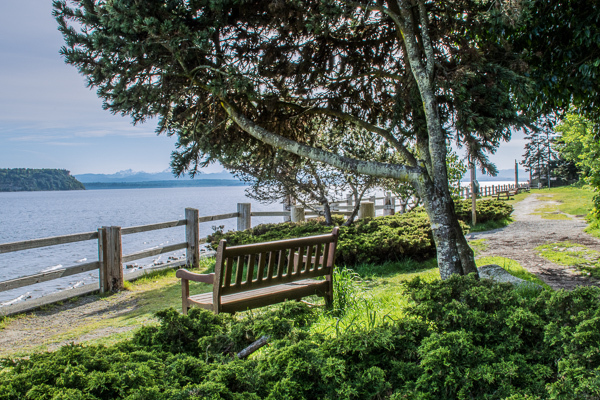 You’ll want to get into an island state of mind as soon as possible, so head straight to First Street in Langley and down the cliff side to Seawall Park. (Take the walkway at First and Anthes or the stairs next to the “Boy and Dog” bronze statue.) Breathe the salty air and listen to the meditative surf while spying bald eagles, blue herons, and Stellar sea lions. Spring and fall months bring pods of grey and Orca whales, which feed just off shore during their annual migration between Alaska and Baja California. (The town’s whale bell sounds with every sighting.) You can learn about these giant residents of the Salish Sea at the new Langley Whale Center (117 Anthes). Feeling renewed, browse the quaint shops and galleries displaying fine arts and crafts by Pacific Northwest artists, including Brackenwood Gallery (302 First St.) and Museo (215 First St.). After 14 years of beautifying Carmel and the Bay Area, Debra Campbell brings her design savvy to the island with Trillium Home & Design (111 First St.); take home a custom pillow or piece of handcrafted furniture. At Callahan’s Firehouse Glass Studio (179 Second St.), you can watch a demonstration or try your hand at glassblowing (appointment required). Peruse the tomes at Moonraker Books (209 First St.) and first editions at Gregor Rare Books (197 Second St.), then lose track of time and place in Music for the Eyes (314 First St.) with its potpourri of Turkmenistan tapestries, tribal jewelry from Laos and other worldly wares. Get an added burst from a bite of lavender truffle at Sweet Mona’s (138 Second St.). 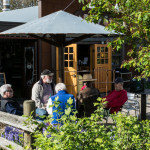 Whidbey winemakers David Ott and Eric Murphy have produced a number of award-winning wines over the last few years, which are readily poured at Ott & Murphy Winery Tasting Room (204 First St.). Cozy up to the bar, or grab one of the wingback chairs and inviting couches. The room’s Saturday cabaret night was such a hit, they extended it to Thursday and Friday evenings, as well (7-9 p.m.). You never know what local talent will be performing, and there’s no cover charge—just remember to tip the musicians. Head upstairs to Prima Bistro (201 1/2 First St.), which has garnered plenty of praise for its French twist on Pacific Northwest cuisine. The chef and owner, Sieb Jurriaans, uses the freshest local ingredients and his flawless intuition to create seasonal menus that might include, say, veal ragout with wild mushrooms or semolina crusted northwest oysters served with a truffle mayonnaise. Warm summer evenings were made for the patio; book your table early. Fallback for Theatre Buffs: South Whidbey Island has an incredibly vibrant theatre community, beginning with the Whidbey Island Center for the Arts or WICA (565 Camano Ave.). WICA is home to the annual, internationally acclaimed DjangoFest (September 17-21, 2014), and the play season runs October through June. Depending upon the time of year, you can catch a quality performance by Outcast Productions, Whidbey Children’s Theater or the Island Shakespeare Festival. Whidbey Life Magazine always has the most up-to-date listings. Half the fun of dining at Muk Café, aka Café in the Woods (5331 Crawford Road) is finding the place. Tucked away on a winding, sylvan road, the former tasting room for Mukilteo Coffee Roasters has evolved into a colorful, art-filled restaurant that’s a local favorite. 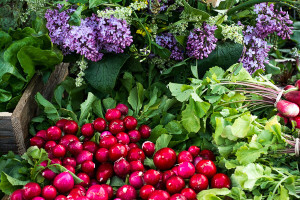 Organic foods are sourced from nearby farms; wash down your veggie-packed Farmer’s Market Breakfast with fresh-made kale juice and just-roasted coffee. Ask for a tour of the roasterie next door. About a half-hour’s drive north of Langley lies one of the loveliest, most diverse coastal hikes in the entire Pacific Northwest. 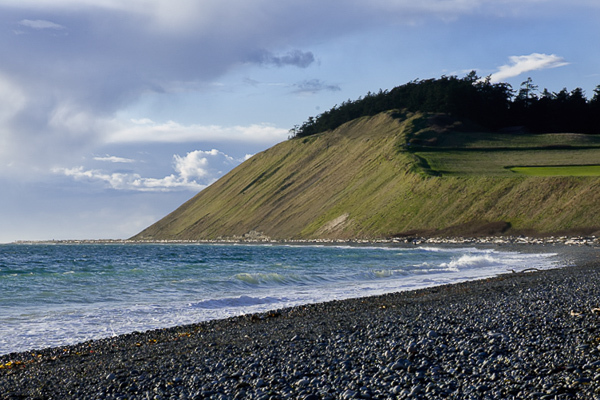 Named for the colonel who helped settle Whidbey in the 1850s (and whose prairie blockhouse still stands), Ebey’s Landing National Historical Reserve (162 Cemetery Rd., Coupeville) offers miles of trails along the bluff and beach; keep an eye out for raptors and bald eagles. This is a great place to bring the kids; call ahead so they can earn their Junior Ranger badge. 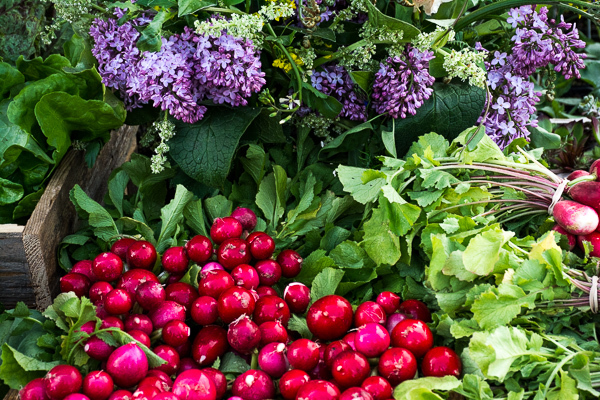 Organic Alternative: Mingle with the locals over organically grown chard and kohlrabi at the Bayview Farmers Market from 10 a.m. to 2 p.m. (Bayview Rd. off Hwy 525). You’ll find stalls with artisan cheeses and breads, sweet treats and gluten-free granola, along with handmade jewelry, woodworking and woven goods. There’s usually a musician or two on hand, as well. While it’s difficult to bestow the title “best ever tasted,” the pies at Whidbey Pies Café at Greenbank Farm (765 Wonn Rd.) come pretty darned close. If you’re lucky, there’ll be a slice of Loganberry left for you, although you can’t go wrong with any of these edible masterpieces; save it for after your roasted eggplant Panini or tuna and Havarti melt. Get a window seat and watch the ducks splash in the pond. Converted farm buildings now hold a number of art galleries, a wine tasting shop and a specialty store, so take a look around. 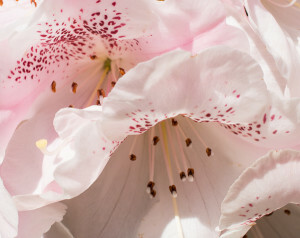 You’re just a few minutes from Meerkerk Gardens (3531 Meerkerk Lane), where you can meander along miles of trails through blooming gardens and woodland preserves. 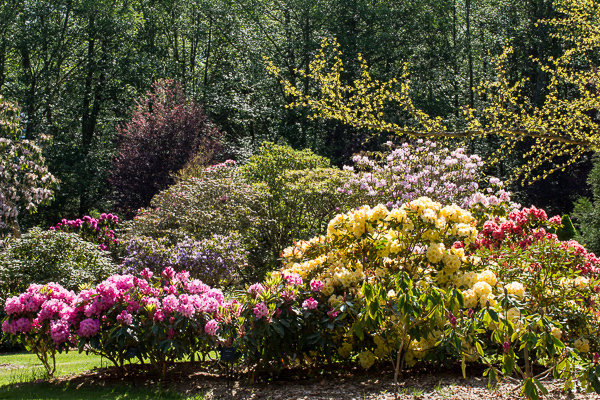 Ann and Max Meerkerk founded the gardens in the 1960s with native rhododendrons, flowering trees and conifers; they were subsequently bequeathed to the Seattle Rhododendron Society, operating as a non-profit and offering botany adventure tours for schoolchildren. James Beard Award-nominee chef Matt Costello left Seattle’s Palace Kitchen for the Saratoga Passage and Inn at Langley (400 First St.), where his restaurant serves up one of the region’s finest dining experiences. Open weekends only (and Thursdays during summer months), the intimate, peak-ceiling venue features a colossal river-rock fireplace and open display kitchen where you can watch Costello wield his culinary wand over king salmon, Penn Cove mussels, just-plucked chanterelles and other local, seasonal ingredients. Reservations advised. Cinematic Substitute: Grab a slice and salad at Village Pizzeria (106 First St.) followed by a film at The Clyde (217 First St.), a Langley landmark since 1937. The historic movie house may show second-run films, but it does so in digital with 7.1 Dolby sound and there’s a great little (adults-only) balcony. Plus, where else can you get fresh popcorn for a dollar? 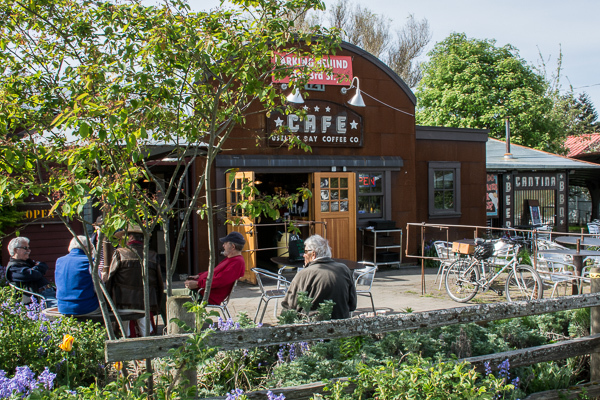 Hipsters and aging hippies pack Useless Bay Coffee Company (121 Second St.) for espresso drinks and yummy baked goods like ginger-pear muffins and chocolate chip-espresso scones. Order a breakfast Panini or Café Omelet with spinach and Applewood smoked bacon to go with your fresh-roasted brew. Owner Des Rock imported a vintage Probat UG15 drum roaster from Europe to process his small batches of rich, dark beans; be sure to bring a bag home. Wear off your meal trekking the Saratoga Woods, Putney Woods and Metcalf Trust Trails. 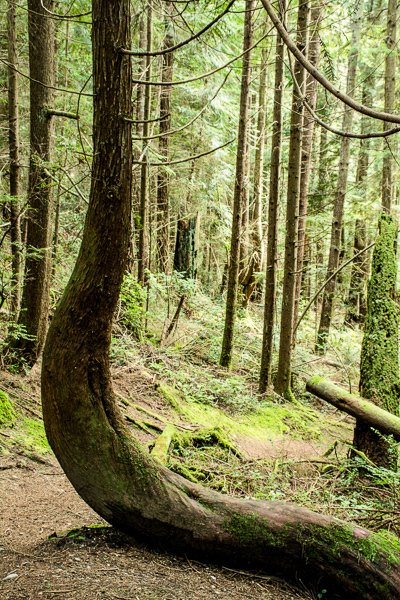 Lovingly maintained by local residents, the three trail systems interlock to provide more than 700 protected acres of Douglas fir and western hemlock, wildflower-filled meadows and bluff terrain with breath-catching views of Saratoga Passage, Mount Baker and the Cascade Range. The well-tended, well-marked trails are shared by mountain bikers and horseback riders, and there are plenty of picnic tables for a rest. Washington State Ferries between Mukilteo and Clinton run every half hour during the day; crossing is approximately 20 minutes. NOTE: Lines during summer season can be long, so plan accordingly, for a full ferry schedule check here. 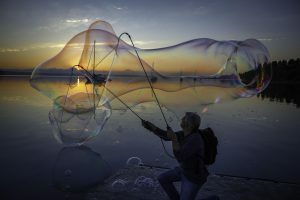 Susan Hanson is a travel and marketing writer who recently transplanted to Whidbey Island. You’ll find her around the south end working on a new web series, compiling notes for an upcoming book, and drinking copious amounts of coffee. What a boon for the volunteers at the Visitor Center kiosk at the corner of Langley Road – am printing as we speak to use as a suggested weekend for visitors. We had 255 people stop in in April, so obviously the word is out on Whidbey – but a suggested tour is always welcomed. I want to move Whidbey but my wife is afraid she will miss the sunshine during the winter months. We live in So. Ca.. Have visited Whidbey 3 times and both love it there but the weather continues to be an issue for my wife. Any feedback from locals would be appreciated. Ken W.
My wife and I moved here from Boise Idaho about 10 years ago. She too misses the sun but we have learned to appreciate he fact that the temperature range here is always reasonable. Never very hot or very cold. Sure it is a little gray sometimes but the air is the cleaner than just about anywhere. No smog or air pollution.In Coupeville, very few insects like flies or mosquitoes. The pace of life is laid back and peaceful, people are friendly. Even in winter there are sunny days and we walk on the beach in February sometimes. I have lived in a number of states and this works for me. When the sun shines here it is appreciated and not taken for granted. A beautiful day here on the island is as good as it gets. Heavy traffic doesn’t exist. Coupeville has one stoplight. If you miss the sun, grab a flight out of Seattle and visit your friends in So.Cal. When you get tired of smog and traffic, come home to Whidbey. Like any place, it’s not for everybody but we like it. Winter is an issue for anyone who needs the sun…many of us leave during the winter for a period of time. Yes, you can be outside all winter and be active, but there is a serious lack of sun during our very short days of winter. Anyone who has a tendency to SAD needs to understand this. That is a real issue here Kern. I’m a California girl and the weather can get me way down. That’s why I do all of my travelling during the months Whidbey has bad weather. You just need to live North of Greenbank, it’s in the rain shadow and gets about 1/2 the rain of the S,Island and Seattle. It is not warm here, though, by CA standards. Summer is 60-70 and sunny in Coupville/Oak Harbor. This from a fourth-generation Pacific Northwesterner. It does rain here, a lot, though not usually heavily. It is very often gray and overcast. I love it, but if you are used to blue skies, sunshine and warmth, this may not be the place for you to live. Some folks get downright depressed on those long, cold, dark winter days when the sun rises at 8 a.m. and is going down shortly after 4 p.m. So, come visit for a few days from the end of November to the middle of January to see how you like it. Or, if you like the summers here, just come anytime between July 4 and the end of September for sunshine and (mostly) blue skies. Thanks so much for the delightful English tea and Downton Abbey viewing at your home last year. Debbie and I enjoyed it immensely. I lost your phone number and address, and would like to keep in touch. May I have them again? Ah… I think I hear the whale bell, now!! 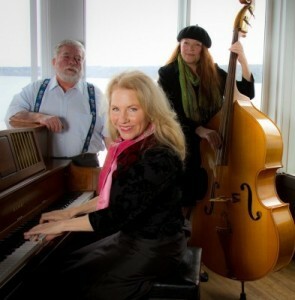 What a wonderful encapsulation of some of what makes Whidbey so special. Unfortunately for us locals, the more people off-Island who read this, the longer the ferry lines will be. I loved growing up on the Island and miss it. It was the best playground in the world. Still have relatives there, maybe I ought to go visit them! Nice article! With all those business names hot-linked, wonderful. Perhaps next time the 3 galleries at Greenbank could get a mention by name too. One thing to know about this itinerary! Pickles Deli is not open on Sundays, so you should make it your Friday or Saturday treat. It is so well worth it! Best casual/take out on the whole island! Hi Erika: Thank you so much for pointing out the fact that Pickles isn’t open Sundays. One of those minor facts that got overlooked when I wrote this … and, even more ironic, I actually have stopped by on a Sunday to discover that fact myself! Duh. The correction has been made, and I so appreciate your personable response–yet another reason why I love this island.